On December 6, 2013 Mr. Hans W. Henzel passed away at his son’s home in Wake Forest, North Carolina. He was 87 years old. Hans was born in September of 1926 in Albany, New York and was a veteran of both the Second World War and the Korean conflict where he was commander of a squadron of tanks. At the outbreak of the Second World War Hans was a student at the Albany Academy where the above picture was taken from its 1943 yearbook. 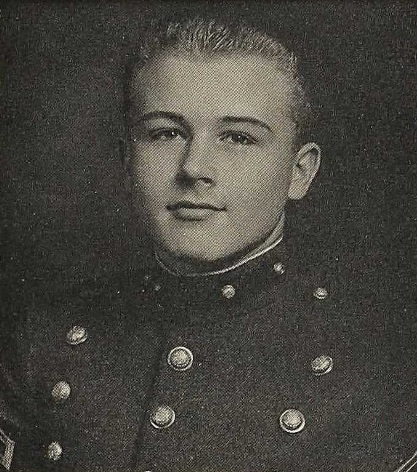 His discriptors for the picture included: “Aggressive, Militaristic, Ambitious” Following service in WWII he entered the Virginia Military Institute, graduating in 1949. He was an officer in the United States Marine Corps retiring with the rank of Lieutenant Colonel. Hans took and passed the written Licensed Battlefield Guide examination in 1989 and passed his orals and was awarded Badge #38 in 1991. He served as a full-time guide until 2007 when he gave up his license and returned to Lexington, Virginia . Failing health saw him give up his Lexington home and move in with his son, in North Carolina where he passed away.